How to choose free DVD Copy Software for Mac? If you are a movie fan who pays good money for your DVDs, the agonizing things came that they're hardly the only format you need these days. And there are huge amount of free DVD ripping software for Mac on the market now. It is so hard for you to choose one because nobody can tell you which one is good or bad or which one is the most suitable for you. To choose the best one, what need to be taken into consideration is the capacity to decrypt any DVD, the output format range, program stability, ripping speed, output quality, user customization, and user friendly level. Here is a list of top three free DVD ripper for Mac users and made a comparison among them. With them, you can backup DVD on Mac, keep them on your media server, and load them on your favorite portable player without any problem. 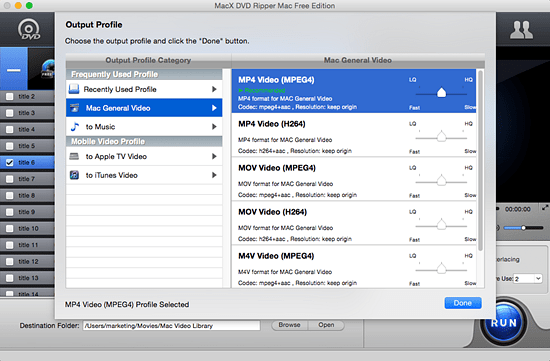 MacX DVD Ripper Free is all-in-one free DVD backup tool for Mac (10.14 macOS Mojave) to backup and rip any DVDs (including commercial DVDs) for free on Mac OS to MOV, MP4, FLV, MPEG, iTunes with the highest possible quality. It is 100% safe and free, and 99.99% works with most DVD copy protections such as CSS encryption, Sony ARccOS, region protection, UOPs, APS, Disney movies copy protection so that users can use the softawre to rip many new movie releases on DVD. It owns the ability of removing CSS, Sony ARccOS, UOPs, RCE, APS and Disney new copy protections. It constantly upgrades to support latest copy protection and Mac operation system. You can even run this DVD ripper on Mac El Capitan/macOS Sierraflawlessly. Fully compatible with Power PC and Intel CPU Mac. It enables you extract audio from DVD as ringtone in MP3, AC3, AAC, take snapshot you favor. You can't edit your DVD videos like crop, merge, add effects, etc. Only support limited video and audio formats. But you can also play the DVD on iPhone iPad Android and other mobiles as it supports convert DVD to MP4 format. Handbrake is an open source of DVD-ripping tool with a strong emphasis on not just ripping media but recoding it for playback on computers, portable devices, and other non-disc based systems. It's a popular, easy and powerful Mac DVD ripping software. Here is a look at how to rip DVD with Handbrake. But you should note that Handbrake stops updating and therefore it does not support the latest Mac systems like Mojave. Plus, for commercial protected discs, Handbrake wont' rip DVD without the help of third-party helper, namely VLC libdvdcss. Add presets for the iPhone 4 and the iPad, as well as the Apple TV 2. Handbrake 0.9.9 now also supports the Blu-ray format, it does not decrypt discs. You may encounter the Handbrake no title found issue when ripping protected DVD. Ease to use, even less finicky users can usually convert DVDs with just a single click. Can be very slow on older machines. May have trouble with DVDs made using camcorders and other apps. The state of Blu-ray support on Mac remains weak due to Apple's indifference towards the format. It is available 32-bit and 64-bit versions for both Mac OS X 10.5 and 10.6, but not PowerPC Macs. 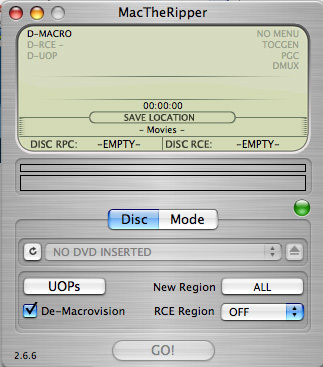 MacTheRipper is a DVD ripper (extractor). It removes CSS encryption, Macrovision protection, sets the disc's region to '0' for region-free, and is capable of removing RCE region checking. However, it doesn't works on Mac OS X newer than Snow Leopard. The 'Mode' tab allows you to select your extraction mode, whether it's full disc, a certain chapter or a particular title. Its interface will look a little confusing. Not user-friendly. Future versions only available by private updates. And Mac The Ripper does not support Lion or above version. Check MacTheRipper for Mac Yosemite. In a word, all of them are good enough to help you deal with common DVD decryption and backup. But if your need rip the newest copy protected DVD and get much more output video formats, MacX DVD Ripper Mac Free Edition will be an excellent choice for you. Note: To play the converted DVD movies on iPhone iPad, now you don't need to go with the complicated iTunes. MacX MediaTrans, a strong and multifunctional video to iPhone transfer software, will easily transfer videos, movies, TV shows in 4K, HD and SD from computer (Mac & Windows) to iPhone iPad on iOS 10 in a flash. Simply by drag and drop, any incompatible videos will automatically converted into iOS supported files without quality loss. If you need more output formats, video editing feature, or want to rip DVD movies with strong encryptions, turn to MacX DVD Ripper Pro, which is the best DVD ripper for macOS Mojave so far. IIt will solve most DVD copy problems with newly released DVD movies with its Safe Mode. Among above mentioned Free DVD Ripper, Which is Best? Vote to Decide! Download best free DVD copy program to rip DVDs to MP4, MOV, AVI, MKV, MPEG-2, ISO image, etc. on Windows 10/macOS Sierra. The top one can even copy protected DVDs like Disney, Sony DVD without encryption tech limits. Which open source freeware you think is the best DVD ripping tool? Handbrake, DVDFab, DVD Shrink or MacX? Don't rush to the conclusion before you really understand these free DVD decrypters for Mac and Windows. Looking for a really good DVD clone software? Here is the right place and you will be able to convert and rip DVDs homemade/protected smoothly and easily with good results.